Virtual New Zealand Stamps: 1998 - 1999 Scenic Stamps. Have you ever laid back and looked up at the sky, or maybe sat on the sand dunes at the beach and watched a sunset. 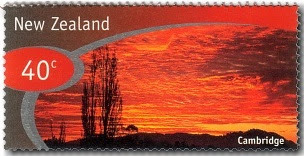 The sky is forever changing, always there as a back-drop to New Zealand's beautiful scenery. 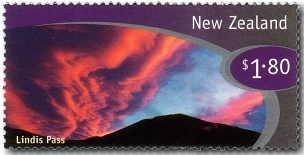 Why not have an issue of stamps in which the sky is the star attraction? 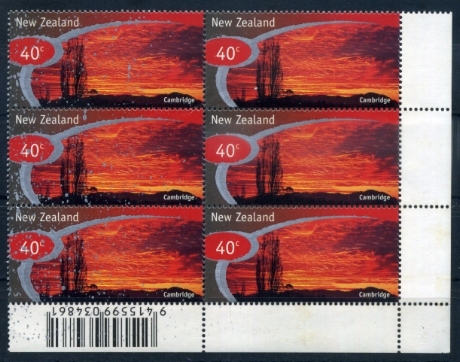 That is what NZ Post decided to do in 1998. 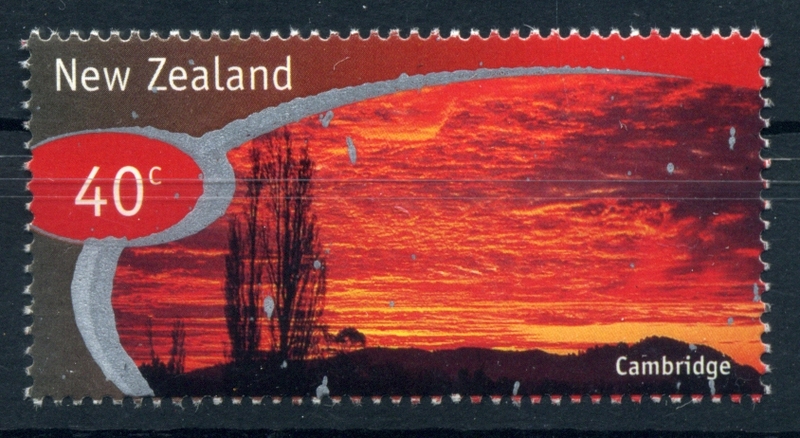 For this issue, photographers have captured the clear blue skies and dramatic sunrises and sunsets that form the canopy above New Zealand; an aspect of the country's landscape that many of us take for granted. 40c - Sunrise over Cambridge. Derek Morrison captures the grace, richness and awesome power of the sun, as it creeps above the horizon of the Kaimai Ranges near Cambridge to bath Waikato farmland in light. These mornings when the sun catches the clouds like this always look beautiful but the day that follows will often bring the rain. 80c - Reflections on Lake Wanaka. Robert E Wells' lens finds a rare moment of reflection on the surface of Lake Wanaka. This lake is completely surrounded by mountains so on a calm day can produce some spectacular reflection scenes off the smooth lake's surface. 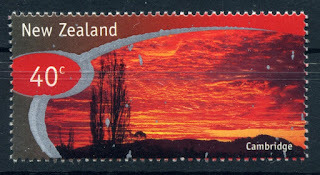 $1.00 - Sunset over Mt Maunganui. Wayne Tait's patience was rewarded with a picture-perfect end to what had been just another dull winter's day as the sun sets over Mount Maunganui. Again its over the Kaimai Ranges that we see this beautiful sky, but this time the view is from the east looking west. $1.20 - Sky & Sea, Kaikoura. Nathan Secker's view from the launching ramp at South Bay in Kaikoura on a day when nor'westers had set the scene for a wonderfully calm sea. Kaikoura is very exposed to the east and south-east but when the weather turns to the west its shelters by the Kaikoura Ranges. $1.50 - Wairaka at Sunset, Whakatane. 1998 The Statue of Wairaka. A seldom-seen perspective, by Cam Feast, of the statue of Wairaka which stands on top of one of the rocks at the channel entrance of Whakatane Harbour in the Bay of Plenty. Whakatane (to act as a man) - This story springs from the classic period of Maori migration to New Zealand. The women of the Mataatua Canoe, left to themselves when the men went ashore for the first time, found their waka (canoe) beginning to drifting out to sea again. If something wasn't done soon the waka and all the women would be lost on the rocks at the harbour entrance. While the canoe still held all the paddles, these were tapu to women and could not be touched, but a high spirited teenager, Wairaka, who was the daughter of Chief Toroa, boldly seized one of the paddles and began to paddle the waka back to shore. Other women followed her example until men swam out to take over. As she did this, Wairaka shouted, Kia Whakatane au i ahau (to act as a man), and her actions saved the women but also coined the name of the town. 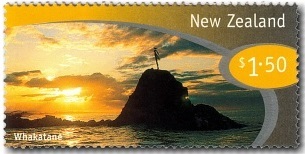 A bronze statue of Wairaka stands on a rock at the Whakatane Heads to commemorate this act. $1.80 - Lindis Pass Sunset. Finally, unusual cloud formations hover above Lindis Pass just before sunset in a scene photographed by Nathan Secker. This is a great photograph. Jetstream over the Southern Alps produce the effect caused by the sun catching clouds driven by strong winds. 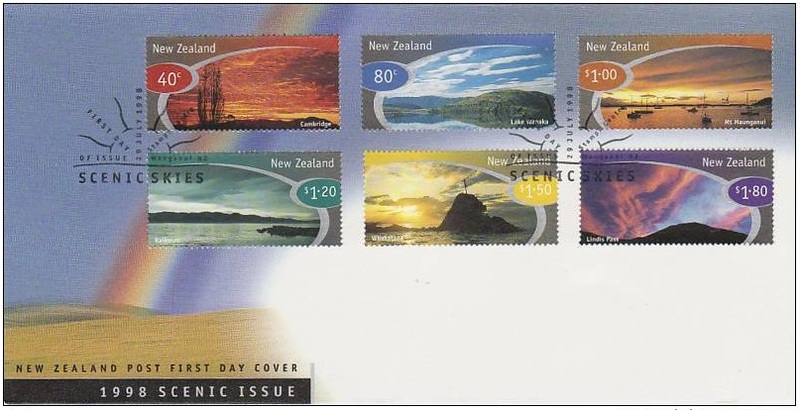 First Day Cover features a rainbow. The 40c value suffered this splattering in the silver colour caused by the printer getting too much ink on the rollers of his machine. Once this has been discovered, he would quickly cut back the ink supply but the best way is to run through waste sheets until the colour balance settles. 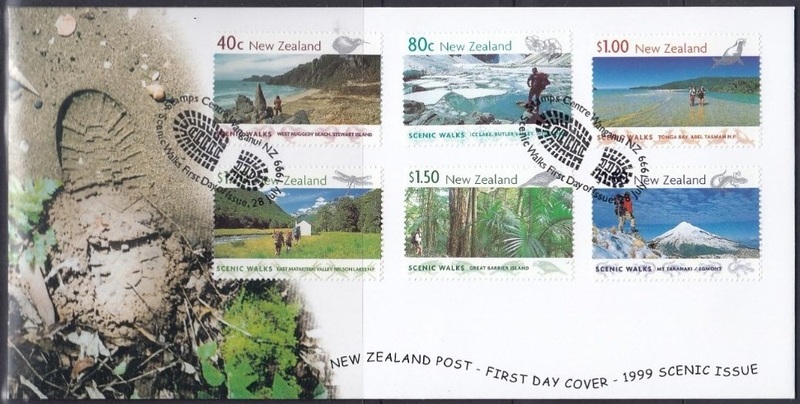 The last scenic issue of the century features views from some of our more famous walking tracks. New Zealand has some amazing landscape, often with some great walking tracks. 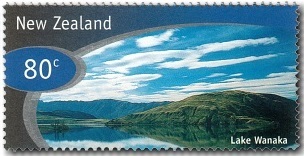 They are popular both with local New Zealanders and with tourists from overseas. 40c - West Ruggedy Beach, Stewart Island. 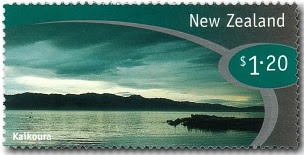 Stewart Island is the least disturbed of the three main islands that make up New Zealand. The Ruggedy Mountains in the north west of the island, so named for their dramatic jagged appearance, are one of the most remote parts of New Zealand. Frequented mainly by trampers and hunters, this area of the island receives only around 600 visitors per year. Attracted by the rugged wilderness of the north west circuit, visitors need a high level of fitness and experience to walk the tracks. 80c - Ice Lake, Butler Valley, West Coast. Ice Lake is one of many small glacial lakes scattered throughout the South Island's Main Divide. Lying north east of Aoraki/Mount Cook, New Zealand’s highest peak, Butler Valley is a remote wilderness area, attracting mountain climbers and hunters tempted by thar and chamois, introduced species of mountain goat. 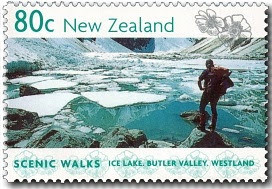 Butler Valley in the Whataroa catchment and neighbouring Perth River area are suitable for experienced mountaineers only, due to its deep gorges, turbulent rivers and rough terrain. 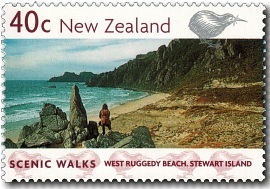 $1.00 - Tonga Bay, Abel Tasman National Park. Abel Tasman National Park, with its golden sands, safe beaches, sculptured granite cliffs and family camping ground, is very popular with New Zealanders and overseas visitors. 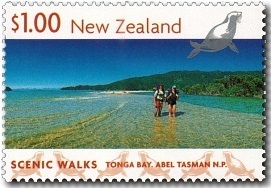 The Abel Tasman Coast Track, which takes three to four days, is the most popular walk in New Zealand with 27,000 overnight visitors per year. About halfway along the track is Tonga Bay. Here, on Onetahuti Beach, also known as Big Tonga, visitors can look out to Tonga Island Marine Reserve and its central feature, Tonga Island. The island is home to fur seals and little blue penguins. 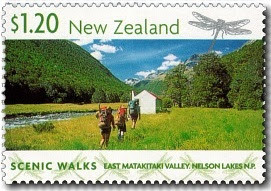 $1.20 - East Matakitaki Valley, Nelson Lakes. Inland from Nelson, south of Murchison, lies Matakitaki Valley, the largest valley in Nelson Lakes National Park. Its long but easy tracks traverse wide grassy clearings and sphagnum bogs giving views up and down the valley. The glacial history of the area can be seen in some of these side valleys with their deeply cut U-shape, smooth bedrock and alpine tarns and bogs, left behind when the glaciers melted and disappeared. $1.50 - Great Barrier Island. Once extensively clothed in kauri, Great Barrier Island’s vegetation is still stunning, thanks to the absence of the possums, a major threat on the mainland. Rare North Island kaka, brown teal, kokako and the chevron skink also benefit from the lack of pests. 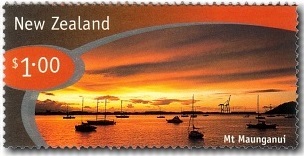 Biologically and geologically, the island resembles the Coromandel Peninsula, which it once joined. Now part of the Hauraki Gulf, it is the largest island off the North Island coast, with more than 60 per cent of the island under formal protection. 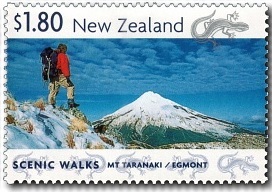 $1.80 - Mount Taranaki / Egmont. A significant landmark in the central North Island, the dormant volcanic cone of Mount Taranaki/Egmont stands guard over Egmont National Park and the lush dairy pasture and coastline that surrounds it. Formed of lava, the steep-sided mountain seems to have an almost perfect conical shape from some viewpoints. The forest on the slopes of Taranaki/Egmont is rich with epiphytes dangling from branches and spongy mosses blanket the ground and the gnarled tree trunks. Alpine herbfields and subalpine tussocks grow on the slopes further up the mountain, but are buried by snow in winter. First Day Cover for this issue. Technical information - 1998 Scenic Skies. 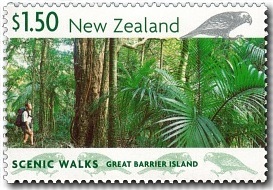 Technical information - 1999 Scenic Walks. In you Kupe post you clearly state that you do not believe there was The Great Migration but here you state that there was. You really need to change this. Thank you Moa. We have fixed this now.